Events unforeseen and the United States government conspired to delay my arrival in the city by four hours. I had set aside sufficient time to unpack, undress, put on my suit and make it to Coi for an early dinner, but instead, I had to make my way straight from San Francisco International to the restaurant. The comedy of my consequent enforced, cinematic-style change of clothes in the back of a cab admittedly assuaged some of my annoyance, but I also took comfort that Coi – an archaic French term for tranquil, but today commonly used to mean speechless/quiet – implied that it could be the perfect antidote to the day’s aggravating events. Chef-patron Daniel Patterson opened the restaurant almost three years ago to the day (14 April 2006) and it is fair to say, it has gone from strength to strength since, winning two Michelin stars along the way. The chef, whose interest in cuisine was fostered by childhood summers spent in France, began his career in the kitchen at fourteen back in his native Boston. After a couple of years at Duke studying literature, he moved to California in the eighties, working at Zola’s then in Yountsville at Mustards Grill and Domaine Chandon, before setting out on his own with Babette’s in Sonoma in 1994. Five years later, Patterson moved back to the city with Elisabeth Daniel, where he made a name for himself with an experimental if not fashionable style. The restaurant eventually closed in 2003 with Patterson taking a two-year break before returning as the debut chef at Frisson – a sort of contemporary supper club. It was during this time that the chef started using essential oils in his cooking and co-authored a cookbook on the topic with perfumer Mandy Aftel, ‘Aroma: The Magic of Essential Oils in Food and Fragrance’. 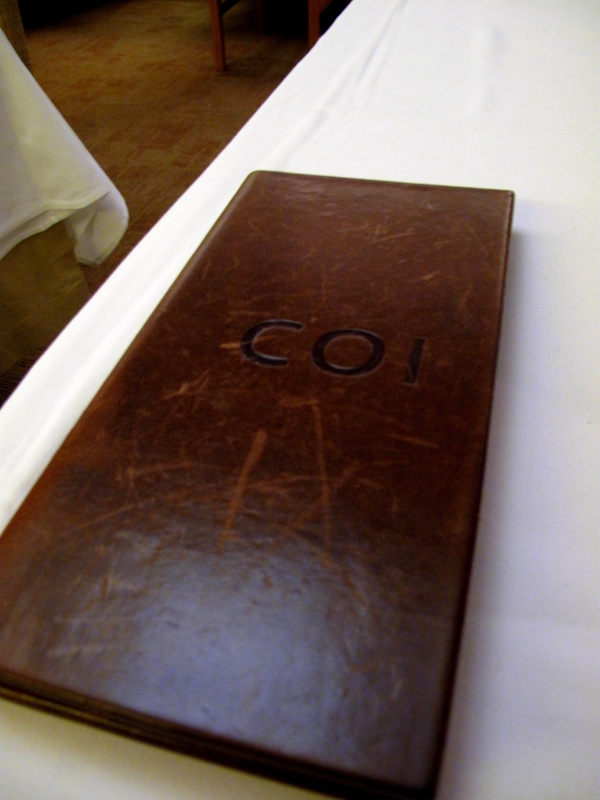 However, only a year after starting at Frisson, he left to open his third restaurant, Coi. His subsequent success here has encouraged and allowed him to extend his interests, for instance, he is now consultant chef at Bracina, a new restaurant in nearby Oakland. In his spare time, he is still very interested in literature, writing for various publications, including the New York Times, wherein he wrote maybe his most popular piece, ‘To the Moon, Alice’, in November 2005 (shortly before Coi was unveiled). This article caused a lot of controversy. Although generally assumed to be an affront to Alice Waters of Chez Panisse popularity, Patterson was in fact chastising the Bay Area chefs who chose to merely mimic her food steps and rely on the region’s prime produce for results, in stead of showing any creativity or technique. When the chef is not writing, he plays keyboard in a band – Syd’s Last Trip; in his own words, ‘think Sonic Youth meets Pink Floyd’. 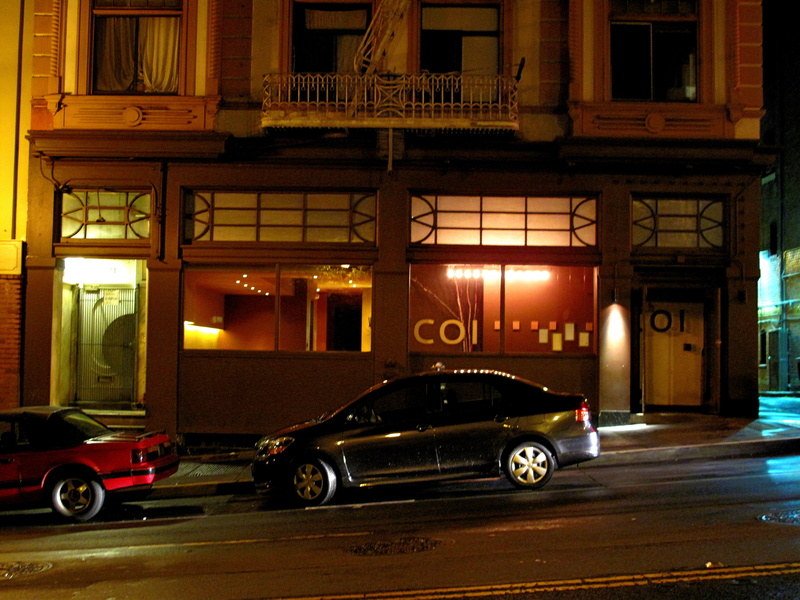 Although Coi is found in San Francisco’s financial district, the strip clubs and adult video shops that litter the neighbourhood are enough to inform even those unfamiliar with the city that Broadway must be a forgotten fringe. The restaurant, which inhabits a nearly hundred-year-old historical building, resides adjacent Centrefolds – one of said strip clubs and the hottest entertainment in San Francisco (so says Google). The interior, designed by Scott Kester, who previously also collaborated with Patterson at Frisson, is split into three: there is the informal lounge with room for twenty; a smarter space seating twenty-nine; and private area for up to eight guests. To reach the main room, one enters into a small reception bay before passing through a corridor past the lounge, which is filled with burled walnut tables, furred Flokati pillows (made by the chef’s girlfriend) and photography from acclaimed local Catherine Wagner. 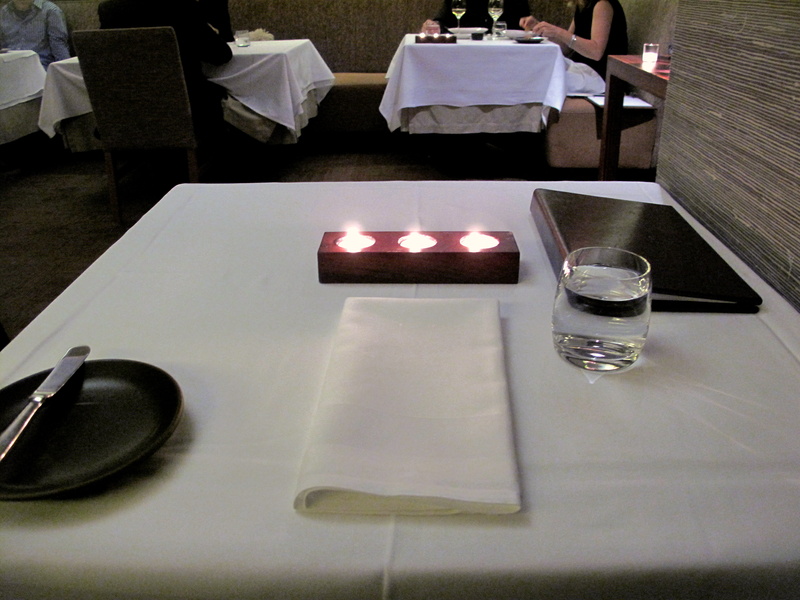 The dining room, drawing on a Japanese aesthetic (where the designer has worked and chef eaten) is less adorned. 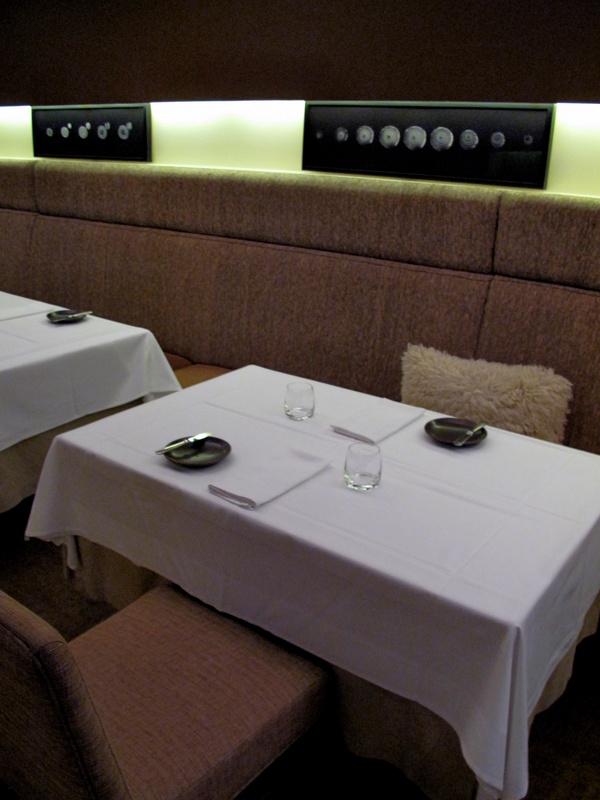 The narrow room is bordered by two banks of banquettes of bouclé-like earthy beige yarn, white linen-layered tables and mossy-brown chairs. The carpet is a light woody brown, whilst the ceiling is covered in wagami, laden with leaves. The main lighting in the windowless space comes through this paper panelling and from recessed spotlights behind the tall banquettes. Most of the earthenware crockery is made by Edith Heath; the cutlery is Italian; and stemware, Spiegelau. Some colour is provided by two large bouquets that sit in black vases on a wooden stand opposite the entrance. The room reflects an organic, earthy and hermetic sentiment with little to distract the diner. The dining room has a semi-set menu made up of eleven courses with some calling for a choice between two dishes; there is also some flexibility as regards the final number of plates taken. 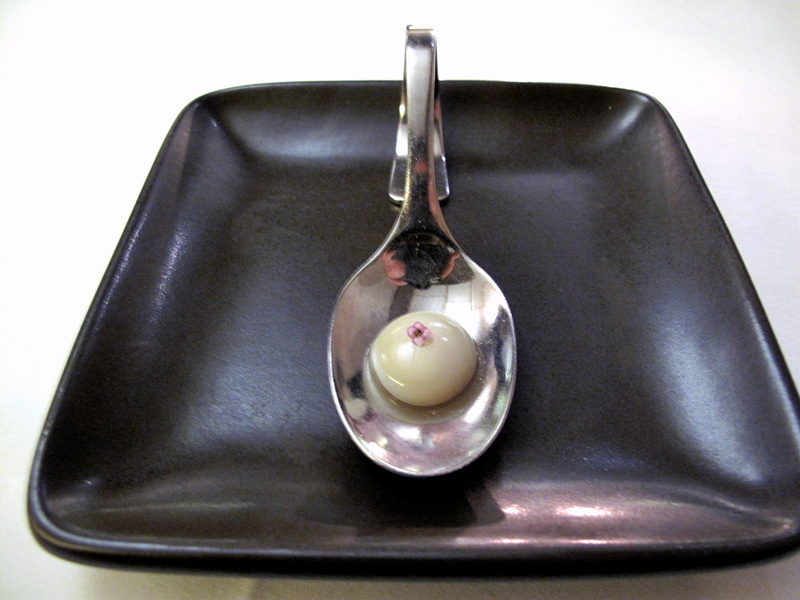 Amuse Bouche: Milk and honey. To start, a serpentine silver spoon was served within which a spherificated milk and honey bubble sat, topped with alyssum flower. The little ladle presented an introduction to Patterson’s multi-sensory methods; the small, sweet-smelling flower suggestive and prescient of the orb’s own honeyed creaminess. Entrée 1: Pink grapefruit; ginger, tarragon, black pepper. 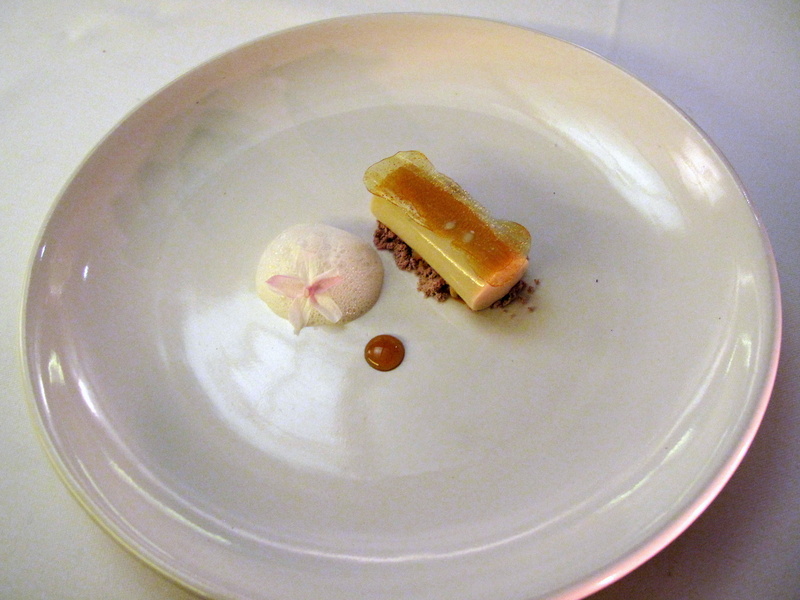 A foamy white cloud of pink grapefruit encased icy sorbet of the same fruit and its supremes, steeped in cognac-tarragon gel and infused with essential oils of black pepper and ginger; upon the same plate, a speck of Coi perfume – formed from the same edible elements as adjacent – was supplied. Instructions included sniffing the scent – redolent with spicy and floral notes – prior to starting with the starter. 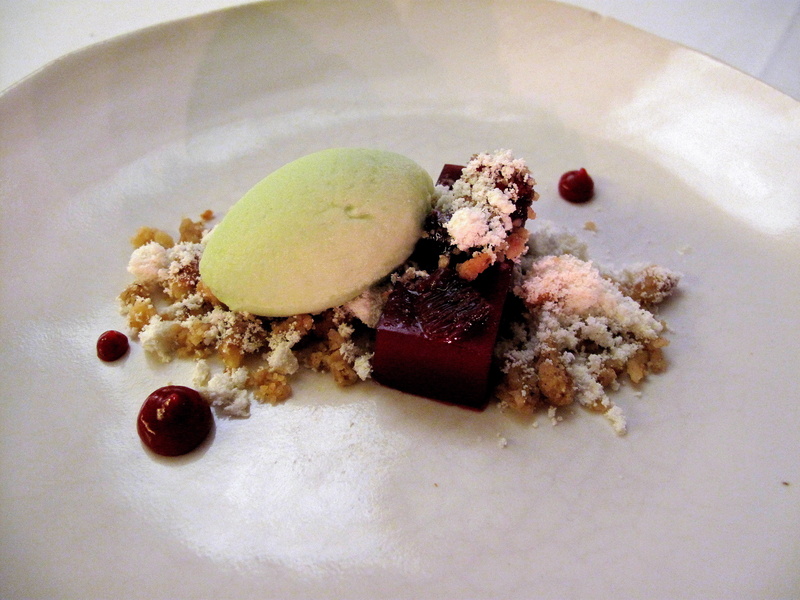 Under the thick froth, the sorbet was sour and sharp, whilst the succulent citrus segments were sweet and tart. Some latent spiciness slowly came through from the warm ginger, aniseed-like tarragon and pepper. They left behind an interesting linger of contrasting savours, but I have to confess that I found the foregoing olfactory exercise ineffective. 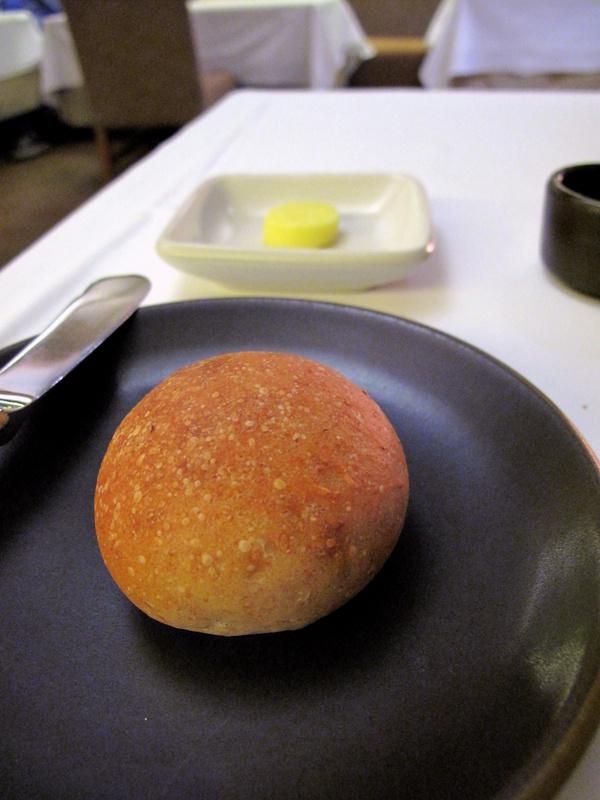 Bread: Brown and white rolls. Two varieties of roll were brought – brown and white. Baked onsite, both were decent. However, although warm and soft, they lacked any real crust, with just a wafer-thin, spongy surface instead. The unsalted, milky light butter was perked up with Welsh sea salt. 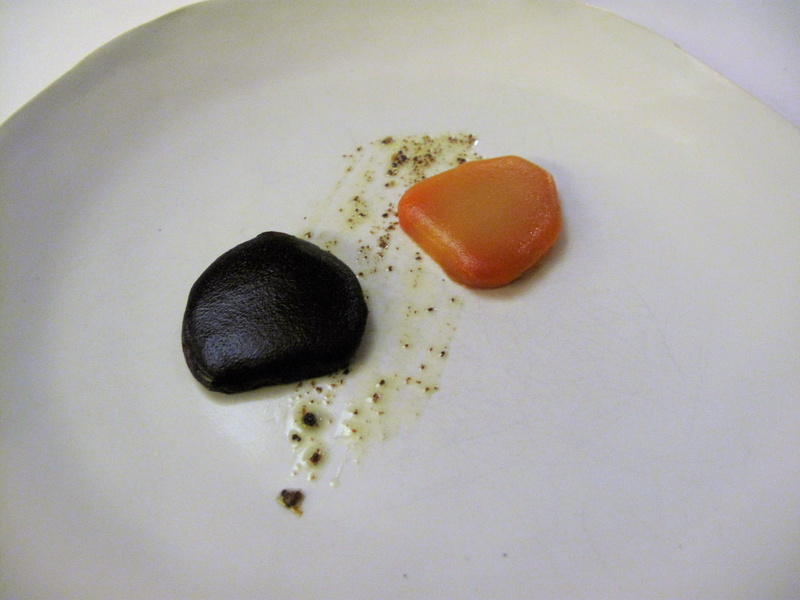 Entrée 2: Shiny beets; citrus scented gel, vadouvan. A vibrant pair of smooth, but bumpy beetroot slices, bringing to mind pebbles gently eroded by the sea, were placed in the plate’s centre atop a smear of glossy vadouvan. Both beets, one regular red, the other golden, were olive oil-marinated, oven-roasted and coated with jelly composed from the beets’ own juices together with essential oils of Kaffir lime and wild orange. The vadouvan was subtle and warm at first, but with slowly increasing spiciness. Each beet – the red distinctively earthy and yellow, sweet – was cool, firm and almost crunchy, in contrast to the creamy, citric sharp gels that covered them. Entrée 3: Inverted Andante Dairy goat cheese and black olive tart; chicories, green apple, mint. 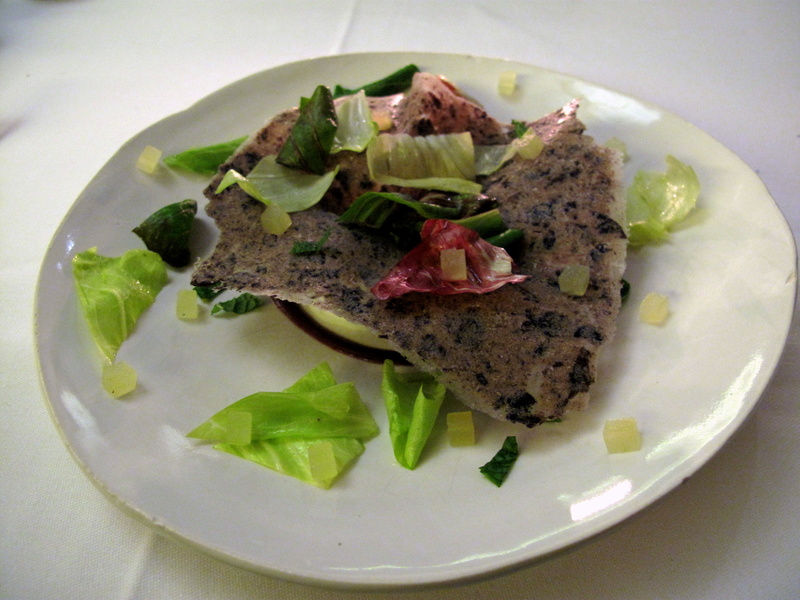 Large beads of goat cheese, enveloped by a ring of black olive and vadouvan vinaigrette, were hidden underneath a thin, crisp tuile of black olive, caraway and rye; cubes of jellied green apple, chicory and mint were scattered over the upside-down tart. The ersatz crust, crunchy and crumbly, had great flavour with slight sweetness and wholesome, mealy aftertaste. Unctuous and pasty, the cheese was gently tart and not at all overpowering, whilst the apple squares added sourness and leaves, a little tanginess. 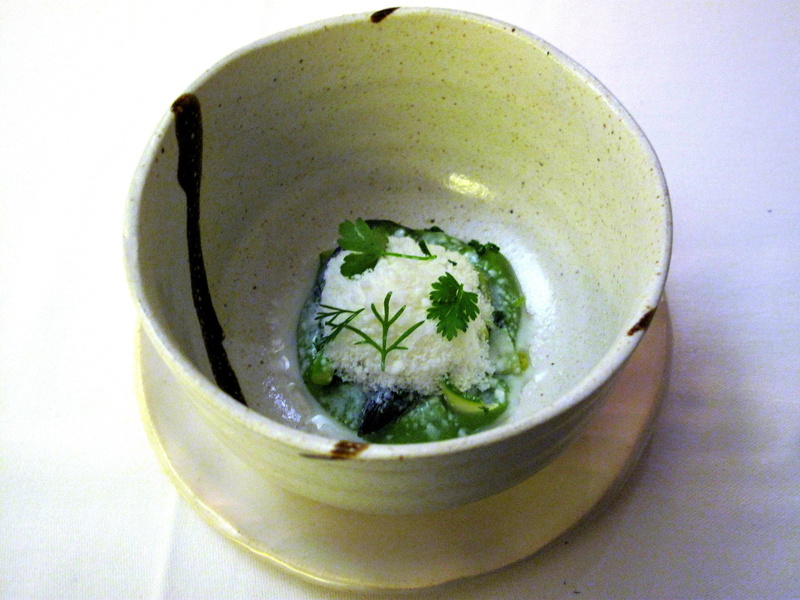 Entrée 4: Winter into spring; early season asparagus, buttermilk snow, herbs. In an Oriental, earthenware bowl, a base of creamy purée lay beneath poached small spears and crisp shavings of fresh asparagus, all under buttermilk powder and herby fennel. This unexpectedly cold ‘snow’, which gave the whole dish a fresher, almost more natural impression, was rather sour, in contrast to the faint sweet flavour of the grassy vegetable, itself accentuated by the fennel’s aniseed. The buttermilk’s cold temperature and green savour of the asparagus personified the feel of winter and spring successfully and surprisingly well. 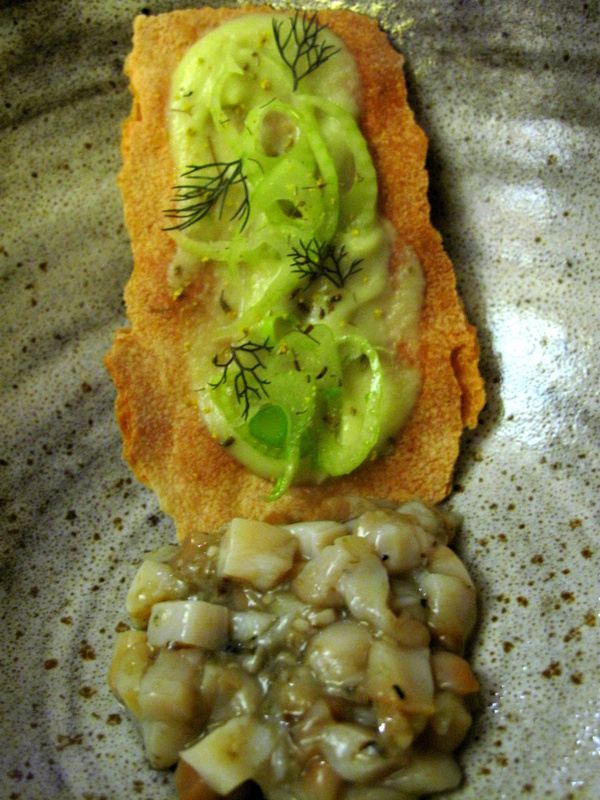 Entrée 5: Abalone/oyster; fennel in different forms. 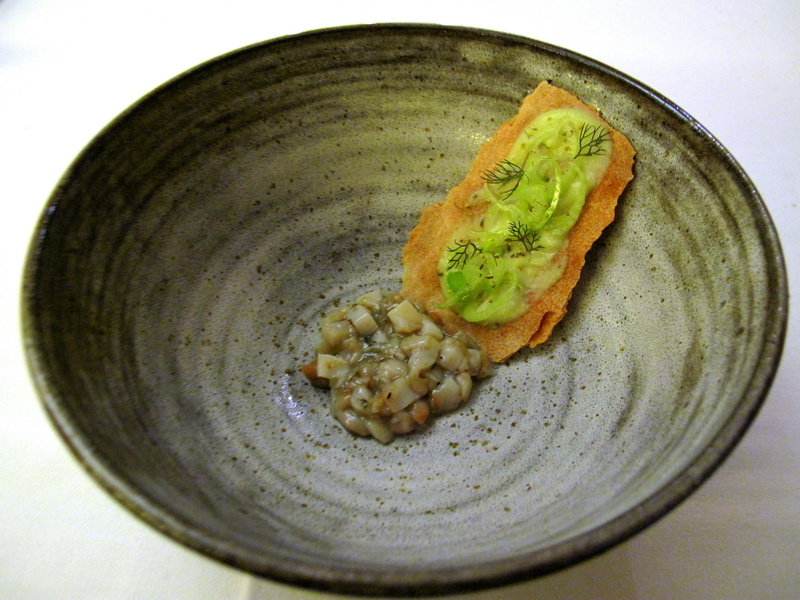 A mixed mass of diced abalone and oyster was accompanied by brittle flatbread that came smeared with bright green fennel purée, carrying lacy cuts of fennel and its fronds whilst peppered with its pollen too. The elemental aroma of the ocean was noticed first and at once. The shellfish had nice, subtle flavour with the chewier abalone complementing the more muculent oyster. Fennel’s delicate sweetness was a nice counterpoint for the rich, marine taste, just as the crunchy cracker was texturally. On a practical point, the bowl, whilst interestingly mimicking an abalone shell, made consuming the contents a little awkward. 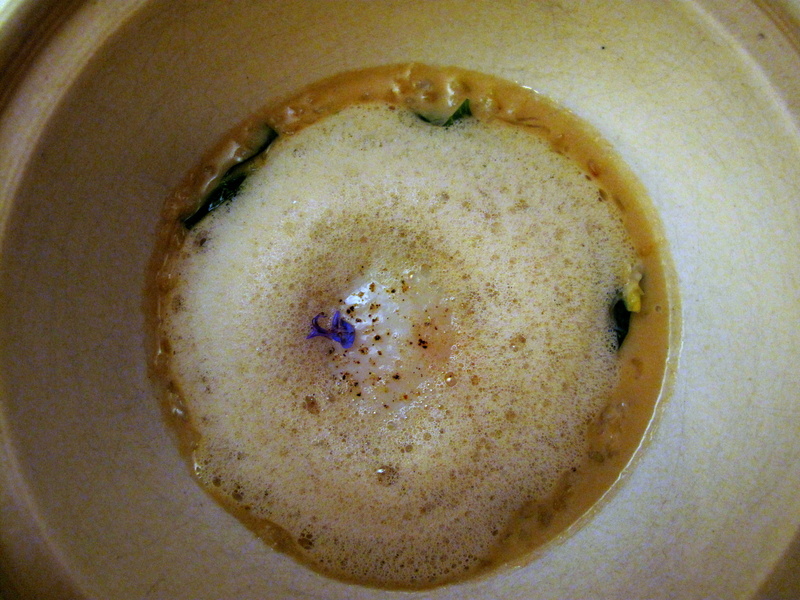 Entrée 6: Fried chicken consomme; artichokes, fava beans and leaves, radish, green garlic. Four fried cubes of chicken consommé, crowned with mustard greens, came resting in green garlic mayonnaise and matched with skinny slices of radish, artichoke and broad beans. Chicken and gelatine soup, that having set had been rolled into bouncy cubes, then delicately deep fried, had crunchy coats and creamy centres, like melt-in-the-mouth croquettes. Buttery beans, crisp greens and peppery radish were all exceedingly fresh, but it was the sweet, mild garlic mayo that stood out. The connection between the chicken and vegetables, however, seemed almost tenuous, whilst some more sauce would have also been welcome and perhaps even solved the former issue. 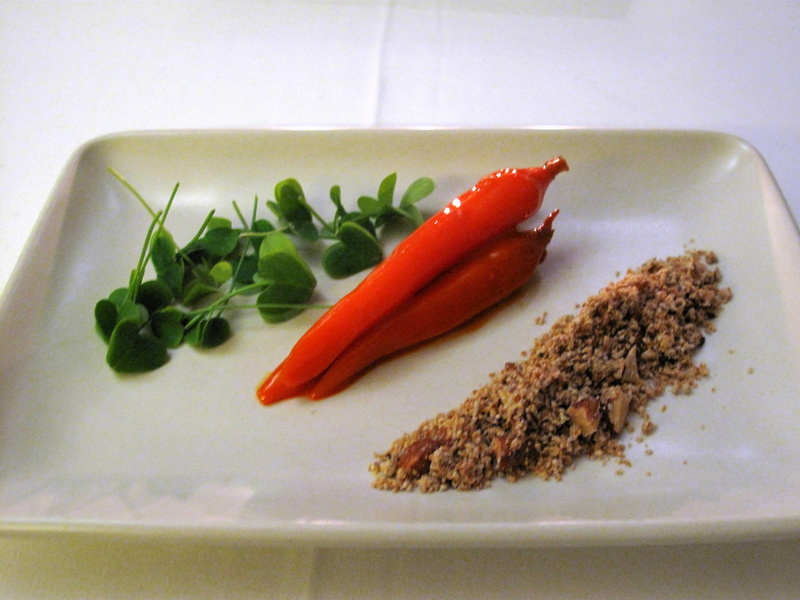 Entrée 7: Sweet, sour, salty, bitter; glazed young carrots, burnt breadcrumbs, almonds, wood sorrel. A trio of glazed baby carrots, gently cooked in their own juices, were served sparingly with only a sprinkled line of wood sorrel on one side and a broad steak of burnt breadcrumbs, chicory and toasted almonds on the other. The straightforward and somewhat austere assembly of this vegan dish’s elements was evocative of the central vegetable as it would exist in nature – the crumbs, chicory and nuts symbolising the soil; the carrots, the taproot; and the sorrel, their leafy green tops. Firm in the middle, edges melting, the carrots were tasty and sweet; the crumbly ‘soil’ supplied the salty and bitter, as well as smoky, with the inclusion of chicory and sea salt especially effective touches. What surprised most though was the crisp, sour-lemon herb, which was strikingly strong and fresh. 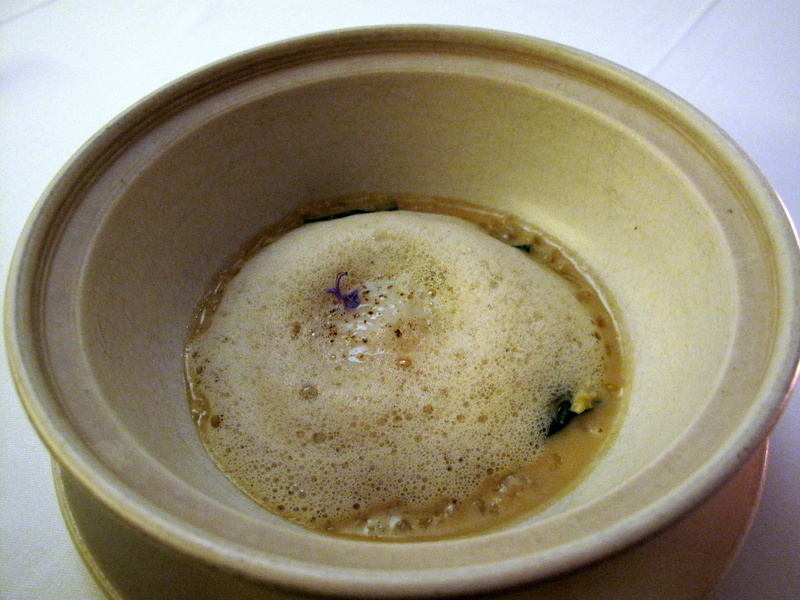 Entrée 8: Earth and sea; steamed tofu mousseline, yuba, fresh seaweeds, mushroom dashi. 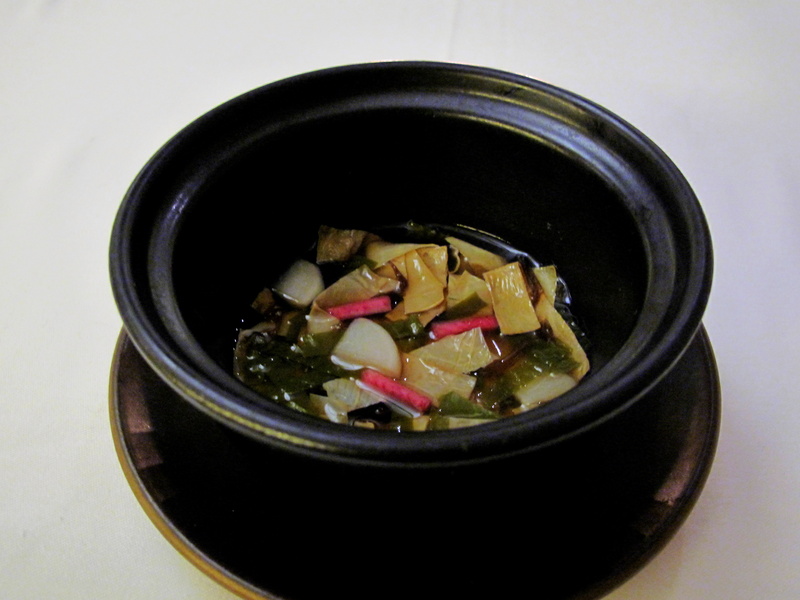 Short, wide strands of yuba from the Hodo Soy Beanery floated in a mushroom dashi with thinner ribbons of seaweed, radish sticks and pickled Tokyo turnip. Portobello, shitake and button mushroom broth, possibly thickened with xanthum gum, was clear, mildly nutty and toothsome. The springy nori and crunchy, intense turnips were agreeable. Pleasingly scented and subtly sweet, pasta-like yuba – dried soy milk skin – were light, milky yet tender and picked up on the nuttiness of the dashi. 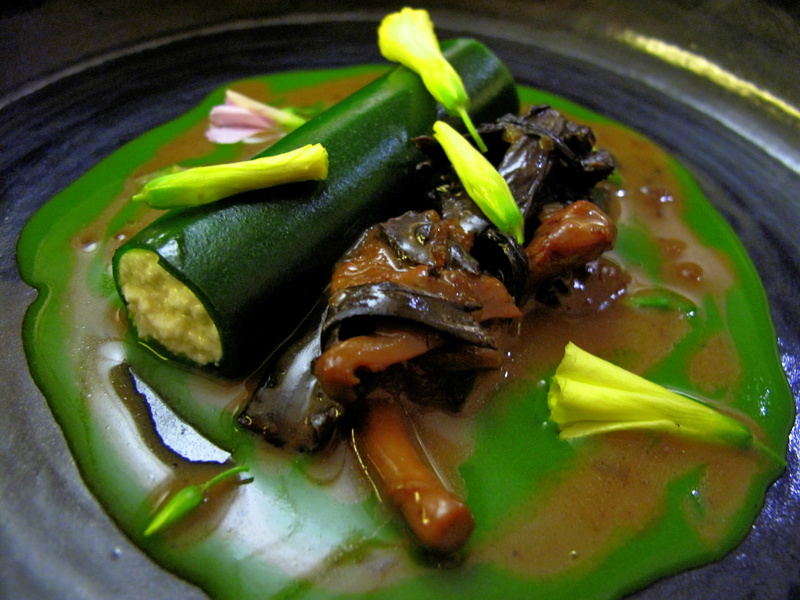 Entrée 9: Nettle-ricotta cannelloni; wild mushrooms, oxalis flowers. A cannellono of nettle, crammed full of ricotta cheese, littered with yellow oxalis flowers, lay alongside sautéed chanterelle, hedgehog and trumpet mushrooms in blended green and brown swirls of nettle and mushroom jus. The nettle jelly wrap had a hint of pepper and hardier savour to spinach that balanced well with the soft, warm, savoury-sweet ricotta. 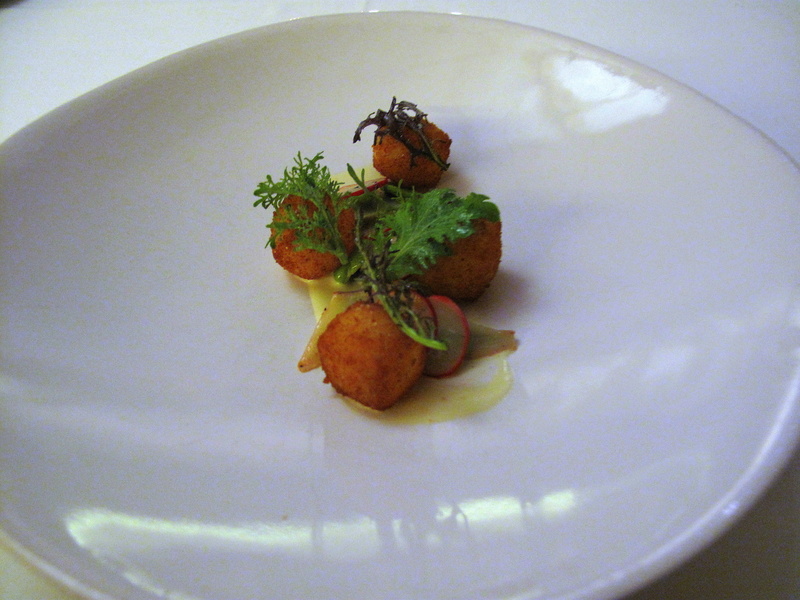 The meaty mushrooms, plump, juicy and earthy, were very good, whilst the crispy flowers, pleasantly lemony. Plat Principal 1: Sturgeon poached in smoked oil; caviar vinaigrette, nasturtium scented potatoes. 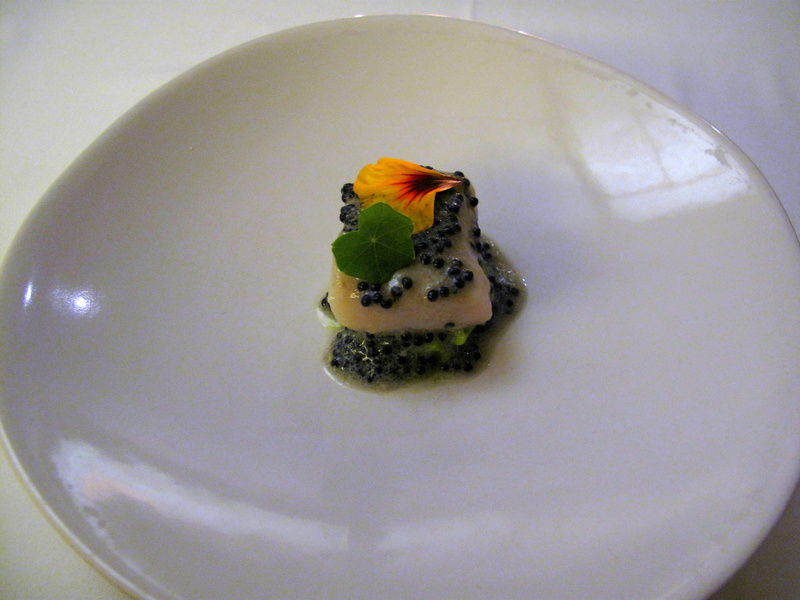 A fillet of white sturgeon, poached in smoked olive oil and dripping with Californian oscietra caviar, was propped upon a bed of nasturtium-crushed potato. The contrast of the fish’s alabaster flesh, freckled with black beads in bubbly vinaigrette, brightened by the verdant tuber base and colourful floral garnish, was pleasing on the eye. 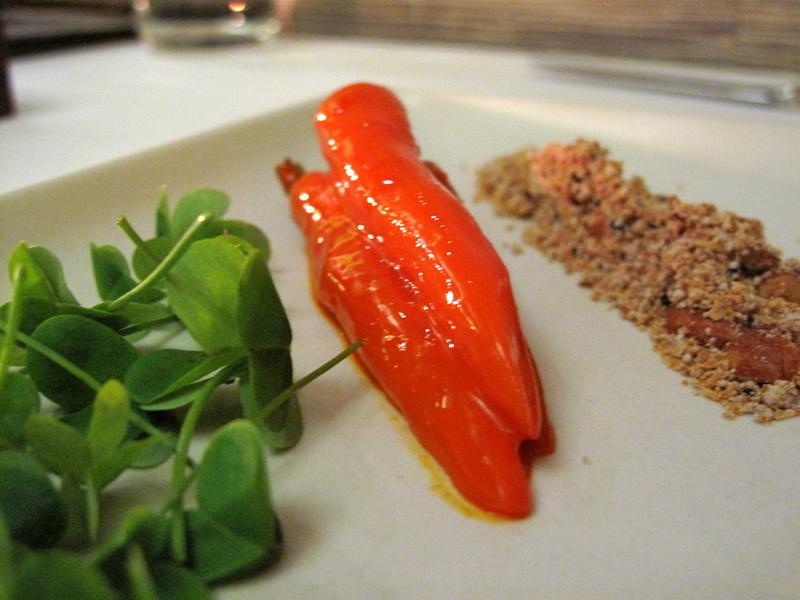 The salty smell of the roe was initially noted and then reinforced by its briny flavour and smooth consistency. It proved an effective condiment to the tasty sturgeon that was buttery and almost sweet. 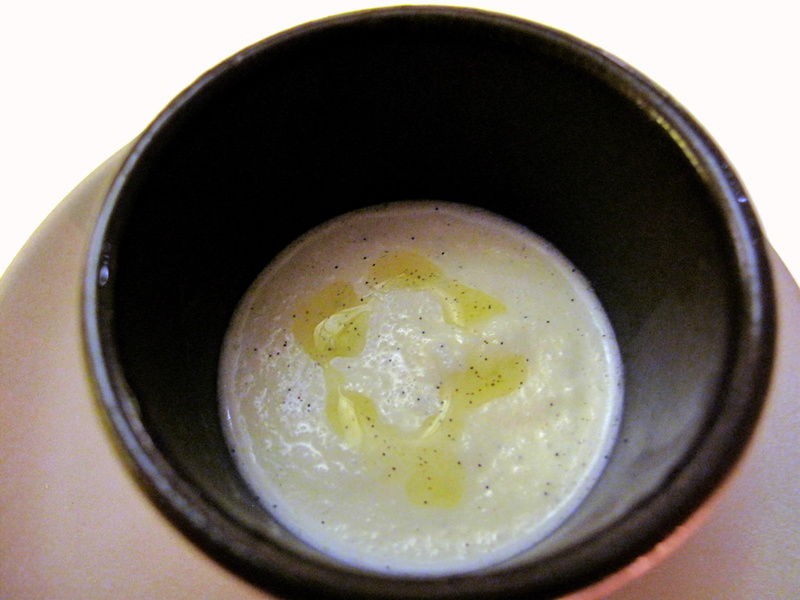 Creamy, rough potato, imbued with peppery cress, was an excellent vegetal foil for the rich, verging-on acidic dressing. Plat Principal 2: Slow cooked farm egg; slow roasted farro, erbette chard, brown butter parmesan sauce. An egg, sous vide, surrounded by slow-cooked green farro, interspersed with erbette, arrived almost submerged in a parmesan beurre noisette whose colour corresponded precisely to that of the plate and aroma was delightful. The farro – an heirloom grain from which all others were derived – preparated similarly to risotto, were plump and nicely salted by the parmesan. Subtly bitter spinach beets soothed the richness of the creamy egg as the rosemary foam added a sweet accent to this satisfying dish. 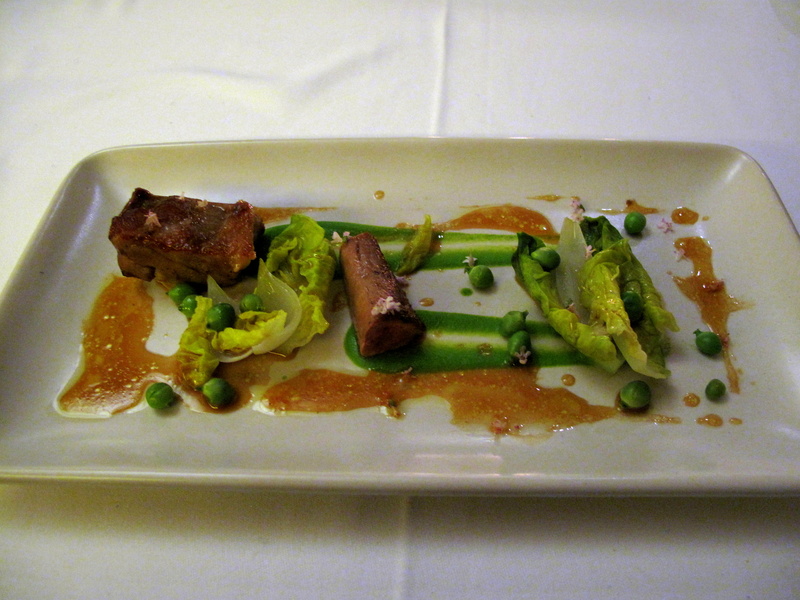 Plat Principal 3: Bellweather Farm baby lamb; English peas, spring onions, little gems, flowering thyme. 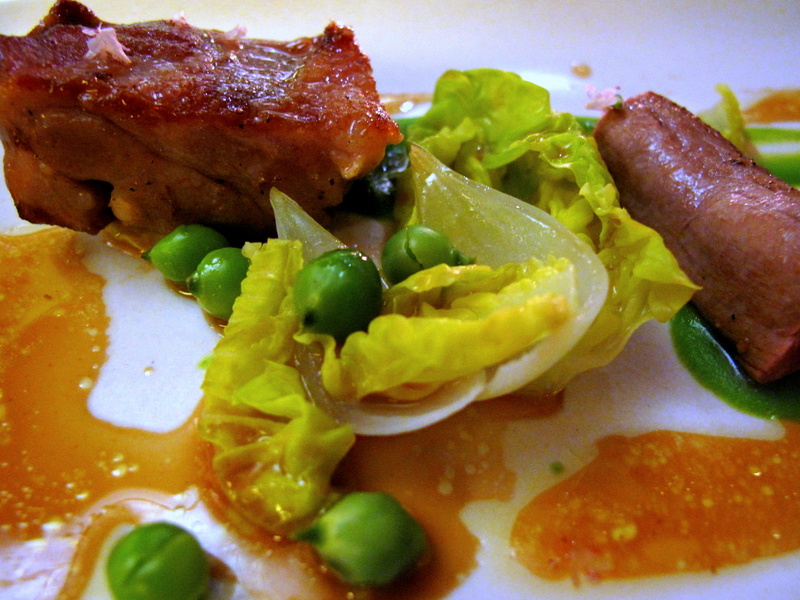 Slow-roasted with mirepoix and thyme, the tenderloin and neck from a baby lamb, were served, each upon a slip of pea purée, drizzled with lamb jus vinaigrette and teamed with little gem lettuce, spring onions and more peas. The loin, layered with a little juicy fat atop, was succulent and toothsome, but the leaner cut of neck was unfortunately a tad dry and chewy. The vegetables were all well-cooked: the moist lettuce, crispy; sweet peas, crunchy; and the spring onion shells, firm to bite. Thyme-flavoured jus had a nice spicy twang to it. Cheeses: Trio (Soyoung Scanlan); toast, spring lettuces. 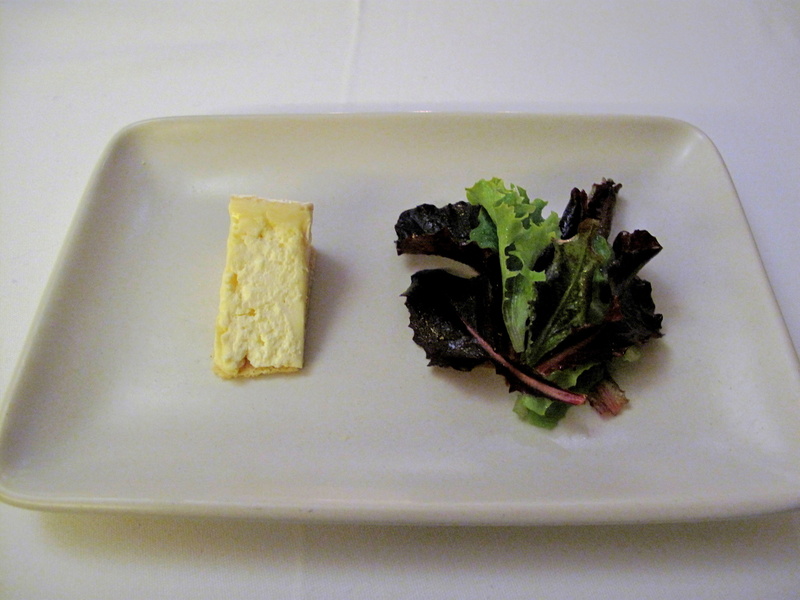 A single wedge of trio – a triple blend of cow, goat and crème fraîche – from the Andante dairy, set on a thin wafer, was accompanied by baby local lettuce dressed with champagne vinaigrette. Trio is a creation of Soyong Scanlan, a musician/dairy scientist who has been growing her own cheeses since July 1999 and giving each a musical moniker; she uses Jersey cows’ milk from Spring Hill Dairy and goats’ from the Volpi Ranch. This example was dense with a pleasingly thick pate and fairly strong, though only hinting of goats’ milk. The fresh, barely bitter greens and slightly tart vinaigrette balanced well with it. 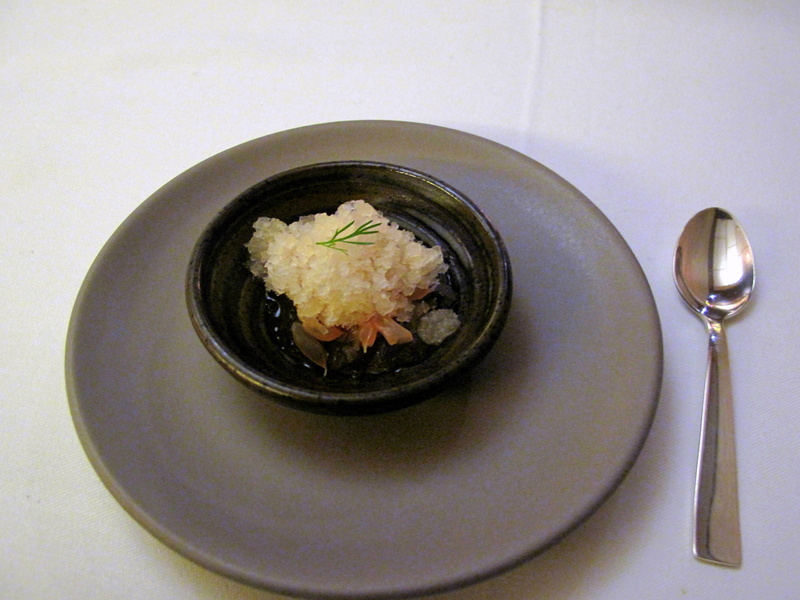 Pre-dessert: Pomelo ice; coriander gel. Segments of pomelo, superimposed by its grantité, were immersed in a gel of coriander. The meat of the fruit was juicy and sweet, whilst its ice was sugary and refreshingly cool; the spiced jelly struck a common citrus note with the pomelo. Dessert 1: Blood orange curd; Douglas fir ice cream, black walnut crumble. A deep burgundy bar of blood orange, burrowed amidst black walnut crumble showered with powdered sugar and possibly confit orange supremes, was presented with a pastel pear-green coloured quenelle of Douglas fir ice cream and splashes of orange purée. The crunchy streusel, nutty with a hint of sweet-smokiness, was delicious whilst the smooth, fruity curd was just as good. Douglas fir ice cream, which had a welcome scent like wintergreen, was sugary, woody and slightly lemony-citrus, linking well with the orange, whose segments were like explosions of mellow juice. 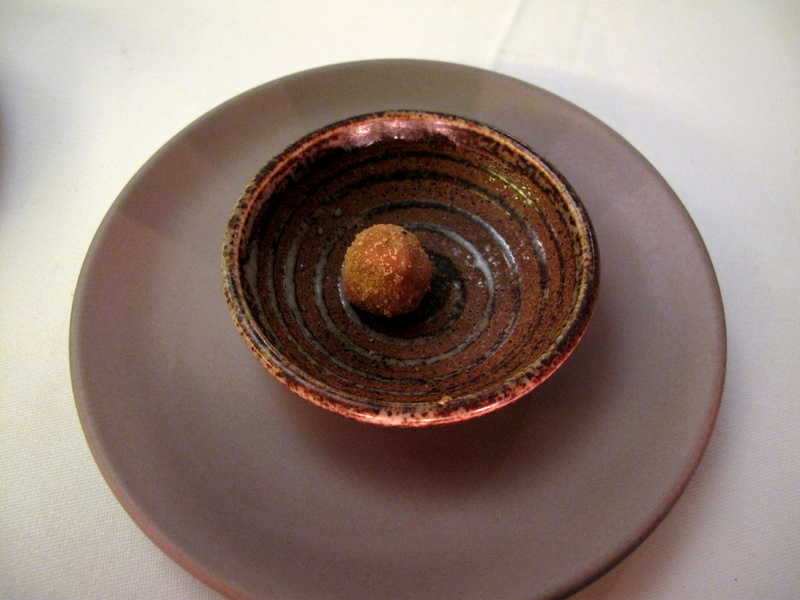 Dessert 2: Carmelized jasmine custard; hazelnut and cocoa textures. A firm custard log of jasmine, carpeted by crushed hazelnut and cocoa nibs and topped with sugar tuile was flanked by frothy splash of jasmine tea emulsion, decorated with jasmine leaf, and drop of gastrique. This syrupy caramel-sherry vinegar reduction was sour-sweet and had real kick. The custard itself was subtle and smoky, its velvet creaminess complemented by the brittle blend of nutty-cocoa nibs – essentially cocoa beans without their shells – that was milky and rich. The foam offered little except some lightly floral scent. Petit Fours: Chocolate ganache truffle and McEvoy olive oil & vanilla milkshake. Brown sugar coated, brown butter truffle was thick, dark and had a touch of butterscotch. The vanilla milkshake, mizzled with mcEvoy olive oil was a treat; the shake’s cool, woody-sweet vanilla enlivened with a whiff of fruity-pepper from the Californian oil. The meal commenced with an interactive if, in my opinion, somewhat vain first few courses. 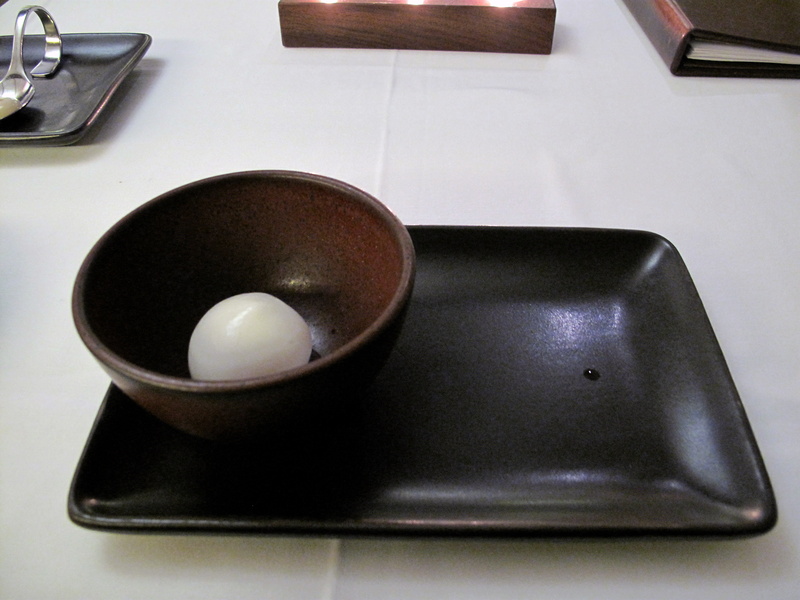 The amuse and initial entrée, both intended to involve and interest multiple senses in a more explicit manner than the plates that proceeded, both had a rather limited effect on me. It was not that I found them gimmicky – after all, the association between savour and smell is well-documented – it is just that the methods by which this connection was made use of did not add to my eating pleasure. That being said, as the dishes continued, my enjoyment of them increased. The inverted Andante Dairy goat cheese and black olive tart was the earliest to excite, followed by the abalone/oyster and sweet, sour, salty, bitter – which I liked especially for its simple yet clever playfulness. The nettle-ricotta cannelloni was tasty, as was the sturgeon poached in smoked oil. The pairing of the fish and its roe, although almost intuitive, is used surprisingly sparingly, but Patterson applied it provocatively here. Blood orange curd; Douglas fir ice cream, black walnut crumble was the best of the desserts and possibly the most delicious dish of all. Dinner was not faultless though with the overcooking of the Bellweather Farm baby lamb the most serious disappointment, whilst the fried chicken consommé, though showing creativity, did relatively little for my palate. When I consider the meal, I would say Patterson’s cuisine was, for the most part, very effective. The food was able to engage me – physically and mentally – through taste, texture and the natural aromas from the ingredients and their cooking. There also seemed to be a subtle pattern in the progression of plates, with the sensory focus shifting from initially olfactory, then textural to finally simple taste. The most capable course was actually one I felt rather indifferent towards. 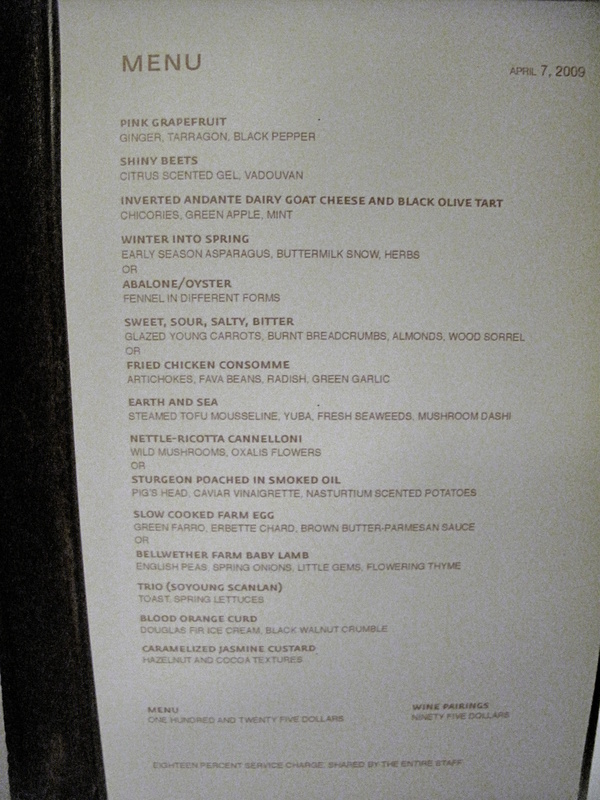 With the winter into spring, I found the flavours decent if not delicious, but I genuinely felt myself able to perceive the essence of winter and spring from the elements within the dish; here, I thought the chef’s use of contrasting temperatures and consistency, as well as his component selection, both intelligent and skilful. The abalone/oyster too, with its compelling oceanic theme, was not far behind in terms of efficacy. 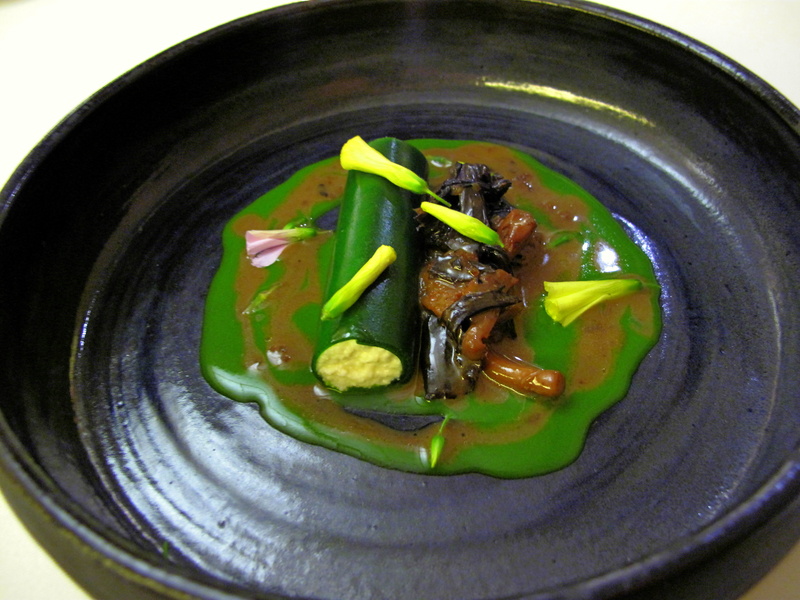 Attention deserves to be devoted to the chef’s excellent produce – I was actually stunned by the pure lemony sting of the wood sorrel that came with the sweet, sour, salty, bitter. I appreciate that California is blessed indeed when it comes to ingredients, but credit ought to go where credit is due. Actually, I can state with some confidence where each piece of produce today came from – I know, for example, that the black walnuts from my first dessert came from Full Belly in Guinda and that my English peas came Iacopi in Half Moon Bay. I know these because Patterson lists every supplier opposite his menu. 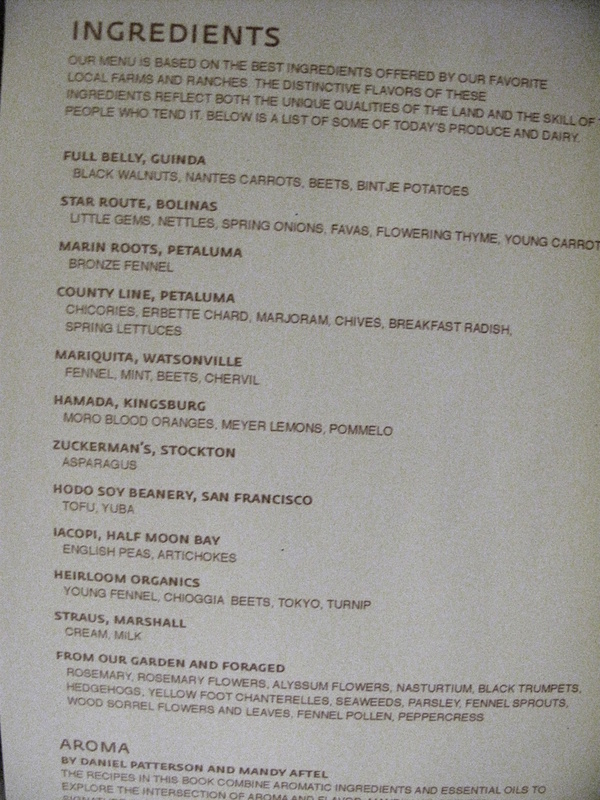 This makes for interesting reading, but also impresses as it shows that all the chef’s ingredients are from local farms and growers, from Coi’s own garden or even foraged (like the seaweeds and alyssum flowers). Judging on what I have read before and since this dinner, it appears that the cooking has become more consistent than it has previously been. Patterson’s skill as a chef or his sourcing has not been questioned, but meals have been criticised as lacking direction or a steady pattern. That was not evident today. Though I cannot nicely label Patterson’s style, neither can I say that dishes followed an incoherent or inconstant path. Instead, what was revealed from the start and remained the same going forwards was the use of prime products, ranging from common to educational, and their careful, but deceptively simple, preparation to produce a balanced and pleasing experience. For one thing, it must be said Patterson is no hypocrite – he is not interested in idly relying on his raw materials to do all the work, he is applying his own talent to making them better, making them more. What struck me most about this meal was my mood throughout and following it. It was one of extreme calm. The dining room, staff and the food all contributed to this emotion. The restaurant became almost my cocoon for that evening, sheltering my thoughts and myself from all but the plate in front of me. FS i have read on verious food blogs over the last couple of years that the US Michelin guide is allegedly padded up? to make the US guide more popular over there, eg restaurants that would be 1* star in europe are 2* in america etc etc. So seeing as you have eaten in this place which has 2* michelin stars, would you say it is on a par with say Hibiscus and the Square which are also 2* restaurants. well, let me say this, from my trip (and this does not necessarily strictly apply to here as 2*s are hard to judge in my opinion), Californian restaurants are undervalued. However, what I would say is that there is an inherent informality (again remember, it is California…) that maybe does them a disfavour. Kent Paul – i would say the 2** & 3*** american restaurants are generally comparable to their european (and japanese) brethren. some 2**’s deserve to be 3***. it is the 1* level that is entirely inconsistent and arbitrary. My husband and I visited Coi when we visited SFC back in March and we really enjoyed it, another place we loved there was Quince which more traditional. The produce in California really makes the food – their vegetables are just so amazing due to the climate. On that same trip we passed by Napa and visited French Laundry and one of their dishes that really sticks in my mind is a vegetarian beet and heart of palm salad, having said that the whole meal was of course extraordinary! Glad to hear you enjoyed SFC! I agree whole-heartedly about the quality of the produce. They are indeed blessed out there. Excellent post! What’s even better is Daniel Patterson weaving his magic on the other side of the bay. 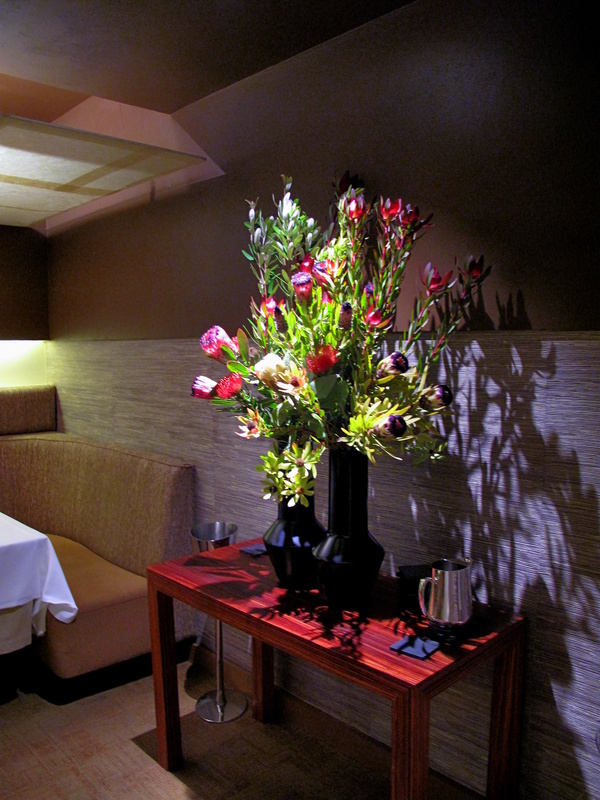 Plum in Oakland’s Uptown district is well worth a visit.